THE SELECTIVE SOUND OF SILENCE? When it comes to the silencing of federal employees, government scientists seem to be most popular kids on the block. According to Canadian Newsstand, phrases about the muzzling of those scientists have appeared in newspapers and wire services included in that database at least 280 times since the 2002 election. But other government workers are also gagged, equally compromising Canadians right to know. MORE POWER FOR THE FEW The federal government’s proposed new copyright law amendment could further fortify the power political parties have in comparison to other civil society groups. Unlike charities and non-profits, those parties can engaged in unrestricted political activities and issue a tax receipt when Canadians donate to them. The Tory’s proposed copyright law amendment could increase that advantage by allowing parties to use news content for their advertising without permission. But, given the fact that a 2006 study estimated just one to two percent of Canadians belong to a political party on a year-to-year basis, one wonders whether all that power is deserved. WHEN THE PRIVATE SHOULD BE PUBLIC Canada’s freedom of information law doesn’t allow the public access to disciplinary records about public servants. But that’s not always the case in the United States. As such, the paper is urging those reviewing the Virginia’s sunshine law “to pay special attention to the personnel exemption that effectively enables” bad behaviour on the part of public officials. Perhaps Canadians should be arguing the same thing? * = I searched Canadian Newsstand for the phrases “gagging,” “gagged” “muzzling,” “muzzled,” “silencing” and “silenced” next to the words scientists, bureaucrats, public servants, civil servants, government employees and government workers. I limited the search to stories that included the words Harper or federal government. I then removed stories about other governments, as well as bestseller lists mentioning Chris Turner’s book The War on Science: Muzzled Scientists and Wilful Blindness in Stephen Harper’s Canada. This entry was posted in Democracy, Freedom of Information, Media, Public Relations on October 13, 2014 by Sean Holman. Quebecor Media Inc.’s potential sale of its 175 English-language dailies may be good news for buyer Postmedia Network Canada Corp. But, in interviews yesterday with CBC’s Calgary Eyeopener, CBC’s As It Happens, CBC News Calgary, CTV Calgary and DeSmog Canada, I argued it will likely be a bad news for Canadians. Here’s the pith of my argument: first, if the $316 million sale is approved by the Competition Bureau, one company will be able to dictate editorial direction to almost every major urban daily in country. Even if that power isn’t used, the possibility of abuse is enough to give pause to anyone concerned about democracy and debate in Canada. Second, despite Postmedia president and chief executive officer Paul Godfrey’s assurances, this deal will likely result in layoffs and newsroom closures, further reducing the resources the fourth estate has to hold power to account in this country. And third, the birthing of such a behemoth will almost certainly push the already endangered beat of media criticism to the brink of extinction. After all, the number of journalists willing to risk future employment by criticizing the country’s largest newspaper chain would be few and far between. This entry was posted in Democracy, Media on October 7, 2014 by Sean Holman. 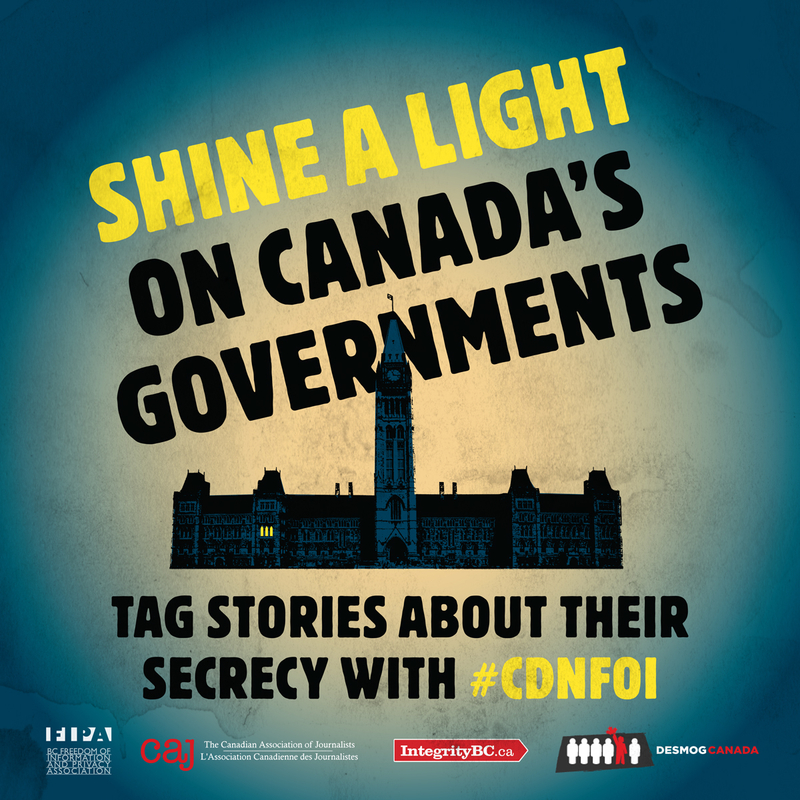 The campaign to encourage Canadians to tag stories about government secrecy with #cdnfoi on twitter has so far been a success. According to the service Hashtracking, from September 17 to 24, there were just 79 tweets using that tag. But between September 25, the day before that campaign was officially launched, and October 2, there were 1,018. That’s almost 13 times more. But what made us decide to promote #cdnfoi , which was originally created by former Canadian Press deputy Ottawa bureau chief Dean Beeby, over another hashtag? Well, here’s the list of the other options that were under consideration by the campaign’s sponsors — the BC Freedom of Information and Privacy Association, the Canadian Association of Journalists, IntegrityBC and DeSmog Canada — as well as why they weren’t selected. #ATIP This abbreviation for access to information and privacy is common at the federal level but not at the provincial level. ATIP, which is sometimes used as a hashtag for “a tip,” also refers to requests for information under two pieces of legislation: the Access to Information Act and the Privacy Act. By comparison, the principle of freedom of information is about more than that, encompassing the need for policies such as open meetings and less restrictive media relations policies. …the Canadian government has never stated that it believes in [the principle that the public’s right to know is superior to whatever right to privacy public officials might have]. Indeed, it has prevaricated by the very choice of name for its freedom of information legislation: Access to Information Act. It is a cautious title, used only by Canada, Hong Kong and South Africa. It implies that people are entitled to government information but the government has no responsibility to provide it. #FOI This abbreviation for freedom of information is common at the provincial level. But foi is also the word for faith in French and is sometimes used as a hashtag by speakers of that language. #CDNRTK This abbreviation for Canadian right to know has the advantage of being about a powerful principle. But RTK isn’t a common abbreviation, nor is RTI, which stands for right to information. This entry was posted in Democracy, Freedom of Information, Media on October 6, 2014 by Sean Holman.